The new head of Norway’s anti-terror police intelligence unit PST, best known for its secrecy, is herself known as a popular and open police chief from Vestfold County. Marie Benedicte Bjørnland marks a different sort of leader for a security agency that’s been under harsh criticism. Bjørnland, age 47, says she never would have applied to be the chief of PST (Politiets sikkerhetstjeneste) if she’d been scared off by last year’s terrorist attacks on Norway or how they led to the highly public downfall of her predecessor. Justice Minister Grete Faremo, who chose Bjørnland over several other highly qualified candidates, clearly thinks Bjørnland will bring a fresh approach to the job. Bjørnland was born in Kristiansand, grew up in Lier and Sandefjord, was educated as a lawyer and has been a judge in Skien and Porsgrunn. She’s mostly worked within the state police system for the past 20 years, though, steadily rising through the ranks to be police chief in Vestfold for the past seven years. Faremo referred to her as a “development- and results-oriented person” with a solid track record behind her. PST staffers are expected to welcome her police background while politicians hope she can restore confidence in the anti-terror agency that was bashed after last summer’s terrorist attacks. PST itself is under investigation, not only by the commission conducting the review of Norway’s response to the attacks of July 22, but by a special team appointed by Faremo to review how PST sets its priorities. The agency and its former boss who was forced to quit in January, Janne Kristiansen, were harshly criticized for failing to act on tips from an international anti-terror program (Global Shield) and thus failing to get right-wing terrorist Anders Behring Breivik on PST’s radar. There’s also been criticism that PST has focused too much on the threat of Islamic extremists while overlooking threats from right-wing extremists. Bjørnland said the results of the two investigations, due later this summer, will help set the premises for her work as she launches into what’s set as a six-year term as PST chief. One of the new top requirements for the job, according to both PST staff and political leaders, is an ability to communicate well and deal with media questioning. 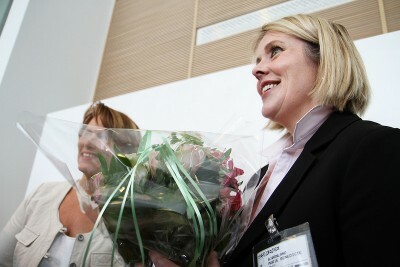 Bjørnland met that criteria in her former post, where she was praised for an open leadership style. PST has long been known as a “hush-hush” agency, but Bjørnland doesn’t see the ongoing need for secrecy as a huge obstacle. “I’ll be open about what I can be open about, and vice versa,” she said. She takes over immediately.